What helps you to stay true to your own style of reading for clients? Thank you, VC, for this question. Before addressing it directly, I’ll say that I tend to “explore with” clients rather than “read for” them. My style is very interactive and conversational. Each person has her/his own wisdom and my job is to guide them to remember it. What helps me stay true to this style of working with the tarot? One thing that helps me stay true to it is my desire to enjoy interesting, Self-actualising people. In my experience, most people who just want to be told something don’t come across as interesting or creative (even though they are, deeper inside). This bores me. I want to engage with people in ways that are stimulating. In addition, I don’t want to come across as a substitute parent who tells them what to do, but rather I DO want to be an attendant to their process. Something else that helps me stay true to my style of tarot consultation is to remember that it’s congruent with who I am as a person. I love questions, so designing spreads/layouts for people and the powerful act of asking something rooted in what we observe about a card jazz me up! As someone who enjoys “aha” moments, this style suits me to a tee. All of this boils down to being true to myself and creating the types of professional relationships that I treasure. Does this answer your question, VC? Image: Nine of Wands (Integrity) from the Voyager Tarot by James Wanless and Ken Knutson. Do you have a favorite tarot process for dreams? Thanks for your question, ML. I have several tarot processes that I use with dreams. I’d like to emphasise that this is more about dream exploration, creating relationship with the dreams, dream opening, etc. rather than giving a definitive answer about the dream, although that can be helpful at times. The unconscious or the Dreamweaver or whatever you want to call it offers these symbols and they can be experienced on many levels. I remember Marion Woodman saying more than once, “The minute you say, ‘I know exactly what that dream means’, you’ve killed it, like sticking a butterfly with a pin.” With that in mind, here are three of my favourite dream-unfolding processes with the cards. 1. This one is one I got from Gail Fairfield’s Choice Centered Tarot back in the 1980s. List the dream’s components (symbols, events, characters, etc.). For each of these components, pull one card at random from the tarot deck. Add one card at the end for the overall message. Weave a narrative from the cards you get. Also be sure to include symbols, feelings, puns, etc. from the dream itself as you interpret the cards. 2. For a “big dream”, write down the dream in the present tense then go through the Major Arcana face-up (i.e. you can see the pictures) until you come to one that most looks and/or feels like the dream. Use this card as a focus. Meditate on it, create ceremony with it, make a shrine for it, journal about it, read as many texts about this particular Trump as possible, relate it to characters from mythology and history, do movement or dance or postures based on the card, etc. Allow all of these things to teach you, to take you deeper into the dream’s energy. Journal about this. 3. To incubate a dream (i.e. 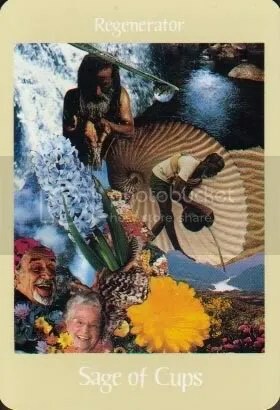 “plant a seed” to receive a response from the unconscious/psyche/True Self/Dreamweaver/whatever), take the Moon card, Trump XVIII, from your deck. Just before turning out your light at night, spend a few minutes looking at the Moon card with the intention that you will have a dream about a particular topic, question, or area of exploration. Then place XVIII on your night table or under your pillow, turn out the light, and go to sleep. In the morning, record any dreams you may have had. If you need prompting, look at the Moon card again. I hope you find these fruitful. Image: XVIII, the Moon from the New Tarot by Jack Hurley, Rae Hurley, and John Horler. Yesterday, I felt drawn to do the Cosmic Walk, aka the Stations of the Cosmos, at a retreat centre near where I live. This spiral walking pattern contains stops where one reflects on moments of the unfolding of creation, from the Primal Flaring Forth (the Big Bang) to the present moment of grace and choice in which we live, rooted in the universe story as articulated by Thomas Berry and Brian Swimme. The Cosmic Walk was created by Sr. Miriam Therese McGillis several years ago to help us enter this story ritually and there are many ways to do it. What is calling me to the Cosmic Walk today? 3 of WANDS (Compassion). My soul’s compassion for all of life and a desire for a spiritual experience that is connective and healing. What is appropriate for me to offer there? SAGE of CUPS (Regenerator). An intention for the regeneration/restoration of our world and anything that makes me feel regenerated in my daily life. Tea regenerates me, so I’ll offer loose leaves of tea that I’ll bless first. What benefit(s) can I receive by performing ritual in the Stations of the Cosmos? 7 of CRYSTALS (Dullness). A relaxed mind and a deeper appreciation for the ordinary/quotidian. I packed some tea into a sandwich baggie, got out my umbrella, and by bus and by foot I made my way to the retreat centre. Before entering the Cosmic Walk, I blessed the tea and asked the Infinite Will to Good to use my time on the ritual path to contribute to the restoration of our world. Each time I reached a station, I paused, spoke the words “For the regeneration and restoration of our world”, sprinkled a few tea leaves on the earth as an offering, and reflected on the mystery or moment of nature’s unfolding that was depicted. At the end, I declared, “This ritual is ended, but its benefits continue,” then trekked home. As I made my way to the house, I wondered, “What might the ceremony have accomplished?” My answer to myself was, “Well, I was engaged in something for an hour or so that kept me from doing any harm to the planet. Maybe if enough people did their own version of that more often, humans would contribute less problems to the world.” Food for thought. I felt calm, alive, and grateful. “I’m curious…do you ever use a pendulum in your work? And, if so, on what occasions? Thank you so much for your question. My Grandma Wells taught me how to use a pendulum when I was about six or seven years old, employing a ring tied to a long piece of thread. I only use it for myself from time to time (maybe once a year or so) and not with tarot clients. I like to stick with one tool at a time so it doesn’t seem like a “smoke and mirrors” show to people. Also, I prefer open-ended questions to yes/no ones because I perceive open-ended questions as more empowering, inviting richer dialogue with our wisdomsource. On those rare occasions when I use it for myself, I pay close attention to my responses to the “yes” or “no” that I get. For me, my emotional reaction to the pendulum’s answer is my true answer. In the spirit of reading everyday events and experiences as oracles, I tell you this story. Earlier today, two instances of religious fundamentalism crossed my path. First, someone commented, “Don’t do it if you really love God” on one of the Facebook notices about my Building Your Authentic Intuitive Practice course. I deleted it and got on with my morning. At mid-day, I checked the mailbox on the front porch. In it was one of those tracts from a literalist religious organisation. So I wrote the words “Unsolicited mail. Return to sender” on it and popped it in the local postbox. I drew a card from the Oracle of Initiation deck after asking, “What message is present for me in the two religious fundamentalist moments?” and got #10, Preparation. It suggests that the ancestors are beckoning me to notice and embrace the holes in what looks solid, to watch for signs and synchronicities revealing more next steps on my earthwalk. This time, I pulled a card from the Oracle of Initiation deck with, “What message is present for me in the faery houses in the park?” as my question and got #52, Acceptance. This card invites me to remember to see my own majesty in such creative acts, to gracefully embrace Life’s lessons so that I can transform in ways that shine. Image: Preparation from the Oracle of Initiation by Mellissae Lucia.